DogFence Hidden Fences are designed to keep your pet safe and to be safe for your pet. Hide the Fence. Not your garden! A DogFence hidden fence gives your pets freedom while keeping them happy and safe in their own garden. You can also use a hidden fence to designate areas that are “off-limits” such as flowerbeds, a gated driveway, kids play area, swimming pool, or BBQ area. We can install a system for a small area or up to 350 acres. We can go over the river and through the woods – or whatever is right for you. Works Well for Cat Containment, Too! Our DogFence hidden fence system works well as a cat fence, too. If you have a dog and a cat? No problem. You can use a DogFence hidden fence as a cat fence and a dog fence at the same time. And if you have several dogs and cats? No problem. Our hidden fence systems can handle multiple pets. And since no two pets are alike, the collar settings can be individually adjusted to suit the breed, size, age and temperament of each dog and/or cat on the system. Secure digital FM technology is the safest for your pet – no other Brand can offer the Safety & Technology. Safelink is our patented FM digital technology that provides the 100% protection against accidentally being shocked from any stray radio signals. All radio dog fences look for signal 24/7 – they check & reject signals from day to day house hold appliances – some other brands can be confused by day to day house hold appliances & signals. We’ve all experienced the noise our mobile phone makes when we place it near the computer, the phone picks up signal from the computer. AM systems are easily confused by noise based interference and this can cause the receiver to activate when the dog is in the house & no where near the zone. DogFence uses an FM signal – FM signals ignore noise based interference. We also use a very low unique frequency to ensure that our receivers will only ever activate if the pet enters the zone. This is FM safelink. For a more in depth description read our “Why Choose FM Page”. 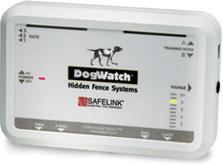 DogFence receivers are the smallest & lightest available worldwide. Our compact Micro receivers in the R12m and R7m weigh in at only 30g and offer a 6 month battery life which is longer than other brands but when it comes to the R12 & R9 DogFence offer up to a 2 year battery life in a compact and durable lightweight case (48g). Every receiver has 3 omni directional antenna (x, y & z axis) to guarantee that the receiver collar will activate at any angle. Every receiver is individually constructed and tested by hand to ensure consistency and quality. All our receivers are warranted against dog chews and our professionally installed systems also come with a lifetime warranty. The combination of settings on the DogFence transmitter and receiver can offer up to twenty different correction levels* to ensure safe and appropriate training for your pet. You can also set your system to “audible only” to introduce your dog gently to the training and his boundaries. With the FactReact transmitted code the receiver will respond in less than 0.125 seconds. A dog running at 20mph covers 14ft in 0.5 seconds. At 10 mph, on our nearest competitors system a dog could get 7 feet into the correction zone before the receiver would activate. The dog would only get 1.175 feet with the FastReact ™ system, therefore your pet cannot out run the DogFence system. All our receiver collars use FastReact software ®. This also enables DogFence customers to set a smaller signal zone which enlarges the usable area of the garden for their pets. Each dog has their own correction level set according to their breed, age or personality. In addition to this the Performance Series collars constantly monitor your dog’s level and if necessary adjust the training level. The receiver correction level will increase by ONE LEVEL if your dog enters the avoidance zone twice in any 24 hour period. The receiver lifts the level for a maximum of 24 hours and then, providing the pet stays out of the signal field automatically adjusts the receiver back down to the original level set. This feature gives extra security for customers whose dogs have added temptation to leave the boundary, i.e. sheep, deer, poultry & game etc. The AutoMemory ® also communicates with the Status light and the light indicator on the receiver collar will let you know if your pet has challenged the boundary (TattleTale ®. TattleTale ® is a great feature for new dogs to the system and also for customers whose dog may try to challenge the boundary. The status light will also let you know that your battery is running down and will remind you to change the battery. Our System 1200+ and Performance Series receivers also contain a status light that lets you know the status of the battery. The status light will warn you when the battery is running low (6 months on the R7 and 2 years on the R9) and will also let you know if your pet has challenged the boundary. Once trained your dog will react to the warning beep, indeed most dogs will know to the cm where the collar activates and will avoid entering the beep area. However, as added protection if your dog enters into the warning beep zone and lingers in this area for more than 8 seconds the collar will emit a correction at the level set. What is response hang on time? – this is the time it takes the receiver to shut down after the pet has left the correction zone, i.e your pet has responded and left the zone and the correction should stop. With DogFence our response hang on time on all our receiver collars is less than 0.1 seconds and from our competition 4 – 5 seconds! We leave our customers to decide why DogFence has consistently been voted a Consumers best buy and is the preferred choice of many vets and animal behaviourists worldwide. In the event that your pet accidentally gets stuck in the correction area the pets receiver collar will shut down after 15 seconds to allow the pet to exit the zone. The receiver collar will revert back to the normal status instantly once the dog or cat is within the safe zone. All other pet’s collars will continue to function as normal – the auto shutdown will only be applicable to the collar which is “stuck” in the avoidance zone. This dual function display allows you to set the signal field width to best meet the needs of your pet(s): a broad outdoor dog fence field for a larger animal or a smaller range cat fence for your favourite feline. It also alerts you to any change in the strength of boundary signal or to a break in the boundary wire. This is an invaluable safety feature for underground fences and fences that are invisible to the eye. Feel confident that your DogFence pet fence is protected should your home experience an electrical surge due to lightning. That’s why we’ve gone to extremes, like no one else, to equip your DogFence Hidden Fence with both internal and external surge protection. External Surge Protection directs power surges and lightning from the boundary wire to the ground rod into the earth and away from your home. Internal Surge Protection suppresses surges coming in through your house wiring and diverts them to your house ground. Our optional PowerPak* keeps your pet fence system working temporarily should you lose electric power. After training, most dogs will stay within the hidden boundary even when the system is not on, but with a PowerPak you have added protection to ensure your pets safety when the power goes out. Provides up to 8 hours of back-up protection. *Available on Performance Series Systems only.